Shadowboxing is the act of moving and throwing punches in a way that mimics fighting or sparring an opponent without an actual opponent present. Punches are thrown to the air as if there is an imaginary person to hit. Having the ability to practice lifelike movement repetitively without an actual threat is instrumental in developing muscle memory. From proper footwork to solid technique, it is important to drill these movements to the point where they are fluid and natural. Getting comfortable with new combinations, defensive styles and general movement can be done through shadowboxing. This is not just a drill for beginners. Professionals at the very highest levels of boxing still shadowbox every practice to reap the benefits of training movement. The overall point of shadowboxing is developing proper muscle memory for solid boxing technique. That being said, shadowboxing can also be a great cardio workout. It is important to remember that when you are moving you should always use proper fundamentals such as keeping your hands up, elbows in and moving your head. Shadowboxing is mostly a freestyle activity and a way to figure out how your body is comfortable moving. This can be done virtually anywhere! If you have the availability of a large mirror to stand in front of while you shadowbox, you should use it. This is a good way to keep yourself in check. If you look goofy, if you drop your hands, if you are slouching it will show in the mirror. This allows faster adjustments and less propensity for bad habits to develop. Boxing is like dancing. There is a certain rhythm to the movement. Everyone is different, but we recommend listening to something you can dance to, and we don’t mean slow dance. Put on something that inspires you to keep up with the tempo and you will see the sweat start to fly. It is fun to throw punches, but it is important to practice your defensives skills as well. 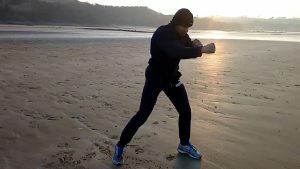 Starting out with one or two minute of just blocking and evading imaginary punches can be crucial to rounding out a solid shadowboxing session. By placing the heavy defensive work in the beginning of your rounds you are more likely to remember proper footwork and blocking throughout the rest of your session. A cone or a piece of tape can make a great opponent for shadowboxing. Having a place marker to represent a person can help with distancing and angles. Try and stay within punching distance of your marker. This will also encourage lateral movement and angles rather than just in and out attacks.